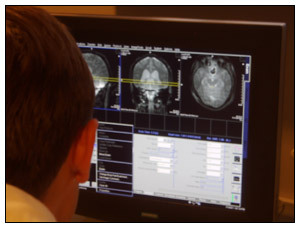 The Center for Functional and Molecular Imaging at Georgetown University Medical Center consists of faculty, research assistants, post-doctoral fellows, and graduate students with expertise in structural, functional and molecular brain imaging. We combine brain imaging with behavioral methods to explore the neural mechanisms of thought, feeling, movement and perception and to explore the mechanisms underlying the acquisition of cognitive and sensorimotor skills. With a particular focus on developmental neuroimaging, we study children and adults with a range of developmental disorders, including developmental dyslexia, autism, and attention-deficit disorder. Understanding the brain mechanisms responsible for learning will provide important new information about the biological roots of the different learning styles seen in these individuals. Our ultimate goal is to utilize recent advances in brain imaging and behavioral analysis in the service of developing improved tools for diagnosis and treatment. The Center for Functional and Molecular Imaging is supported by the National Institutes of Health.